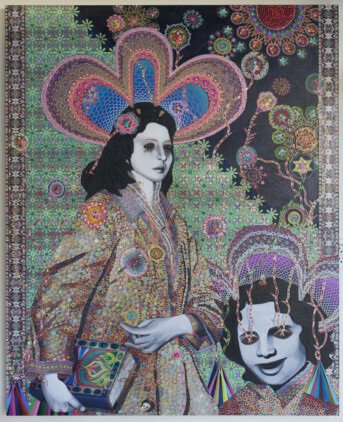 American artist Asad Faulwell’s first solo show in Dubai, “Bed of Broken Mirrors”, features new works from his ongoing series “Les Femmes d’Alger” (The women of Algiers). The series references Delacroix’s famous painting of the same name, done in 1834 in the traditional French Orientalist style, as well as Picasso’s cubist version of Delacroix’s work. But unlike these artists, who depicted Algerian women as exotic, sensual objects, Faulwell highlights their role in their country’s fight for independence from French occupation. By telling the forgotten stories of these women freedom fighters, the artist seeks to draw attention to the situation of women today. Faulwell’s interest in the “women of Algiers” was triggered by Italian director Gillo Pontecorvo’s film “The Battle of Algiers”, which highlighted the role women had played during the 1954-1966 Algerian War of Independence. The film tells the stories of some women who succeeded in getting past the French checkpoints to plant bombs in the French-controlled areas, after which they were captured, tortured, sentenced to death and later pardoned. “Over ten thousand Algerian women fought as equals alongside the men. But sadly, their contribution has been forgotten. And even after Algeria became independent, the situation did not change for the women, who continued to live with various social restrictions imposed on them by a male-dominated society. What struck me after watching the film was that despite being made in 1966, it is so relevant even today because it relates to issues that have still not been addressed. In many places around the world, the way men treat women is no different from the way colonial powers treated their colonies. By changing the stereotypical way Algerian women were presented in traditional French Orientalist paintings, I want to highlight this situation and make viewers think about this issue,” Faulwell says. It took him years of painstaking research to find information about the women featured in his paintings. “They were barely mentioned in history books, but I managed to find a book written by Danielle Minne, a Frenchwoman, who fought on the Algerian side and was the youngest of the female bombers. The book had interviews with other Algerian women bombers and pictures of them, which helped me to create their portraits in my paintings,” he says. His monochrome portraits of Minne and the other women look like the old photographs they are based on, taken mostly in court during their trials. The women look stoic and introspective, but their eyes are closed or hollow. In some of the paintings they appear wounded and bleeding, and in others tears or colourful rays emanate from their eyes. But apart from the faces of the women, the rest of the painting is filled with bright colours. Their Western garments are covered with beautiful knit and embroidered patterns. Around each woman’s head is a flower-shaped halo, and the background is covered with geometric, floral and textured patterns inspired by African, Middle Eastern, central Asian and European artistic traditions. The artist has also incorporated photographs of the women in the patterns, in the medals around their necks or along the borders of the paintings. “In art history artists have used halos, ornate patterns and elaborate clothing and jewellery to depict the importance and power of their subjects. I wanted to create the same aesthetic to portray these women as important people who deserve attention. But I kept the eyes empty because I wanted the figures to look a bit like statues. These are monuments to women who are an inspiration for future generations,” Faulwell says. However, the artist does not want to glorify the actions of the bombers, and has shown some of the women holding a book that advocated the use of violence to overthrow colonial rule. “The name of this show, ‘Bed of Broken Mirrors’ refers to the fact that the women would never find peace because of the destruction they had caused and the torture that was inflicted on them. And the allusion to mirrors suggests introspection on one’s actions. 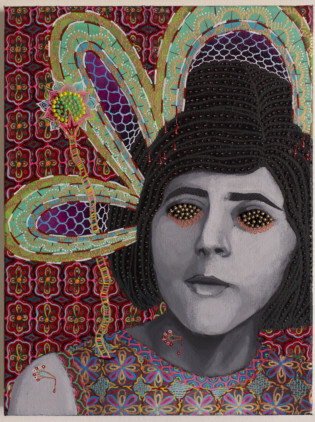 I hope my paintings will make viewers curious enough to learn more about these Algerian women and their stories, and make them reflect on the unfair treatment of women that continues even today,” he says. 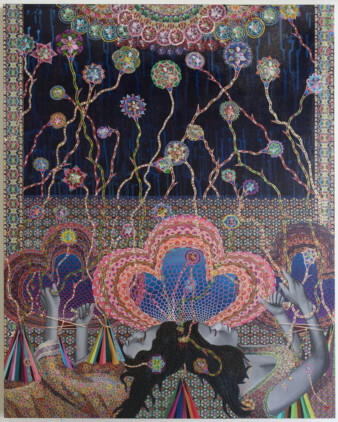 “Bed of Broken Mirrors” will run at Lawrie Shabibi gallery until February 12. In his latest show, “Incidentals”, Dubai-based Indian artist UBIK explores his personal history and migrant identity through the markings on his passport. The “artworks” on display include copies of his UAE residence visa over the past 12 years and the cover of his old passport. A work, titled “One Way”, featuring a page from his passport folded into an aeroplane conveys the artist’s decision to move to India after spending most of his life in Dubai. “I grew up in Dubai and have always considered it home. It has taken me a long time to admit to myself that I am a migrant. This show revolves around gestures, forms and procedures that remind me of my migrant status, such as my residence visa, which validates my presence here, but also negates my sense of belonging to this place; and the stickers on the cover of my passport that remind me that I am just another number. The visas and entry and exit stamps in my passport are like a self-portrait. But my show is also about the thousands of migrant labourers, whose “self-portraits” are lying at typing centres around the UAE, and whose exploitation begins at the hands of unscrupulous agents in their own country. It questions the value of an Indian passport and the perceptions about Indian migrants in this region,” UBIK says. “Incidentals” will run in the project space at Lawrie Shabibi until February 12.